This is an excellent chance for the youngsters who are seeking for the job opportunities. 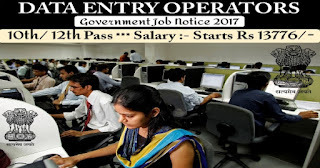 Staff selection commission has announced the recruitment process for the various posts through the online portal. The candidates who have the passion for working with the SSC CHSL board should apply for the posts before the deadline. The SSC board also requests a huge amount of participants to apply for the selection process to get the job posts. The official advertisement from the SSC board for the recruitment process has uploaded in the online portal and daily newspapers as well. The candidates who submit the application form and attend the selection process will be selected for the vacancies of lower division clerk/junior secretariat assistant/ postal assistant/sorting assistant/data entry operator and more. We recommend the candidates to check the official page of the board to access the notification file. The official document has the complete details regarding the eligibility criteria such as age limit, education details, selection process, pay scale and application fee. The candidates who fulfil the expected criteria are allowed to apply for the posts from the online portal. The board also planned to organise selection process for the applicants to shortlist talented and eligible young candidates for the job posts. People who need more information’s regarding the SSC CHSL recruitment 2018 from the online website. Name of the exam: Combined Higher Secondary Level Examination. The applicants should be aged from 18 to 27 years at the time of online application process for the SSC CHSL recruitment 2018. The age relaxation details for the candidates also provided based on the government reservation policy for each category. The contenders must have studied 10th/12th or any equivalent education from a recognised institution or board with minimum qualifying marks. The applicants are asked to attend the selection process such as written exam and interview process to get shortlisted for the job posts. The final merit lists of the aspirants prepared based on the selection process performance. The applicants must pay the exam fees of Rs.100 via online mode before the last date of the application fee payment. The authority will not accept the application forms without the fee. People who belong to the reservation category and women candidates don’t have to pay the fee. · Visit the online website of the board using the link. · Then check for the registration link and open it from the homepage. · Now read the instructions and start to fill the form. · Now fill the details and attach the needed documents. · Check the form once and pay the application fee. · Now take a print out copy of the form for further reference. Starting date for application: 18/11/2017. End date for application: 18/12/2017. Exam date: tier I: 4/3/2018 to 26/3/2018.